CUT YOUR OWN Join us in December for our annual Christmas Tree Harvest Festival. Come and cut a fresh, real tree in the good old-fashioned spirit of Christmas. Make it a Family Tradition.Enjoy the exhilarating fresh air and natural scenery as you wander the fields in search of the perfect tree.Have a wagon ride and warm up by the bonfire with hot chocolate. Expect friendly knowledgable service, most of our staff has been with us for 10 to 20 years. We strive to provide an authentic experience. In 1964 we started one of the first cut-your-own operations in Ontario at our Original Farm. Today we are open at 3 farms in the Toronto area with each farm offering different features and a different selection of trees. All of our farms have tree balers to wrap your tree for easy transport. Remember to dress for winter and to bring your own saw if you can. If you don't have a saw, we will happily loan you one. We also have twine for tying your tree to the vehicle. Feel free to bring your own marshmallows or hot dogs for roasting. Please bring cash - we can't accept debit or credit cards. Dogs on a leash are welcome at all our farms. 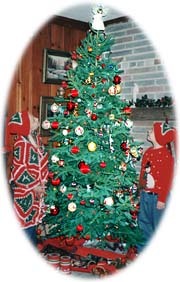 Copyright Horton Tree Farms 2011. The information and resources presented on this site are for informative purposes only, and we cannot guarantees the accuracy, completeness, usefulness or adequacy of any resources, information, apparatus, product, or process available at or from this website.